Final catalogue of the Fine Art Competition "Tears of Happiness"
Final catalogue of the Fine Art Competition "Tears of Happiness" - link. "Tears of Happiness" in Press. An article about the Exhibition "Tears of Happiness" in "Anglia" (Russian newspaper in UK, on-line version - http://issuu.com/angliya/docs/item405_all ). Fine Art Exhibition "Tears of Happiness" in London and Christmas concert, 16-31 Jan 2014. 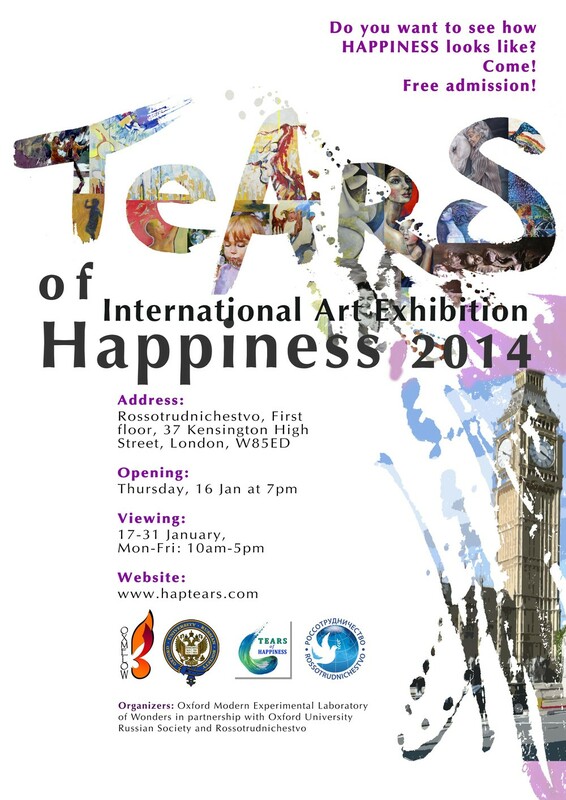 Exhibition "Tears of Happiness" in London, 16-31 Jan 2014. We are glad to announce an exhibition of the artworks "Tears of Happiness" that will be held in London next week. Where: Rossotrudnichestvo, First floor, 37 Kensington High Street, London, UK, W8 5ED. Opening: 16 January (Thursday), 7pm. Viewing: 17-31 January, Mon-Fri: 10am-5pm. While the artworks "Tears of Happiness" were exhibited in Oxford, we decided to demonstrate their copies at the Hollywood Walk of Fame, California. Lord Vader and a transformer are on our side! :)) People liked it! Trophies for the 1st, 2nd and 3rd places of the Competition "Tears of Happiness"
While the artworks "Tears of Happiness" are exhibited in Oxford, we decided to demonstrate their copies in Los Angeles, California. People really like it! Final results of the "Tears of Happiness" Competition: 1st, 2nd and 3rd places. 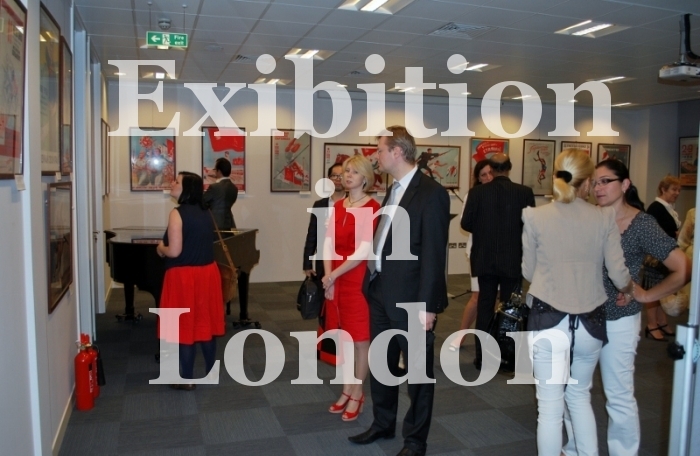 Information about the Exhibition "Tears of Happiness" in London was published in "RussianMind". The picture "Tears of Happiness" by Anna Chaynikova is on the front page! On-line version of the magazine - link. II Exhibition "Tears of Happiness" in Oxford. Green Templeton College Gallery. Viewing: 20 Nov - 18 Dec, 2013. Tags II Exhibition "Tears of Happiness" in Oxford. Green Templeton College. "Tears of Happiness" artworks in Oxford. Part I.
I Fine Art Exhibition "Tears of Happiness" in Oxford. 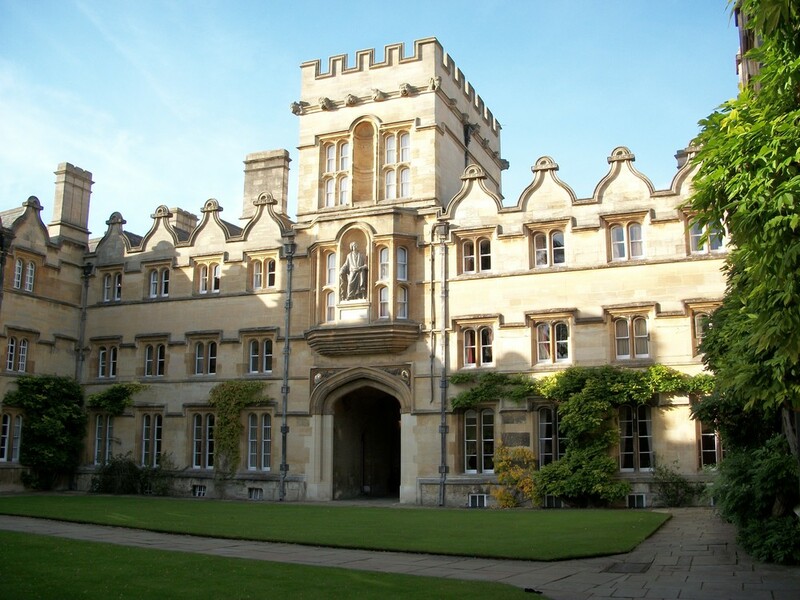 University College. Opening ceremony 15 Nov 2013. This video is only a fragment of a planned video about the Exhibition. Address: MCR, University College, Oxford, UK. Opening ceremony: 15 November 2013, 19.30. 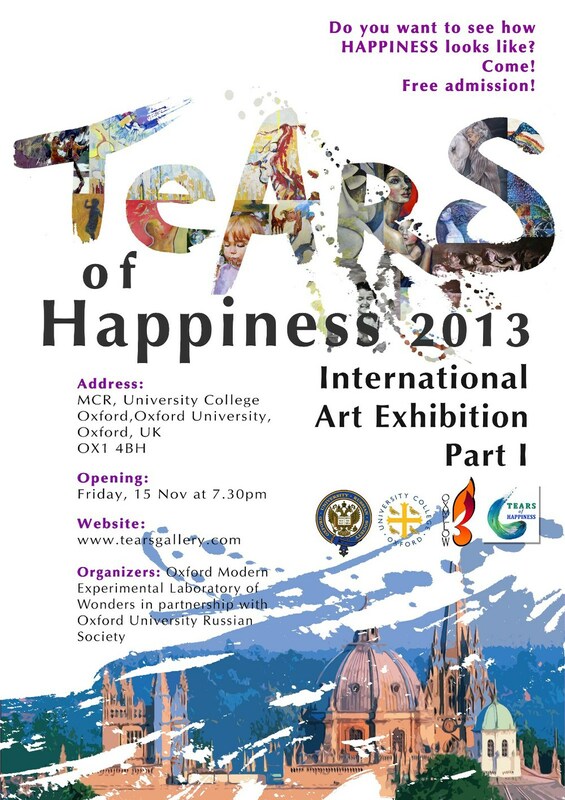 I Fine Art Exhibition "Tears of Happiness" in Oxford. Univ College. Fine Art Exhibition "Tears of Happiness" in Oxford. Part I. Do you want to see how happiness looks like? We proudly announce the Fine Art Exhibition "Tears of Happiness", where you can see how modern Artists portray the Happiness! You are greatly welcome! Please come and share your feelings in a warm company! Opening: 15 November 2013, 19.30. Only the first part of the artworks will be presented. The second part will be presented later. Background of the Project "Tears of Happiness"
The project started in February 2013, when the OxMelow organisation in partnership with Oxford University Russian Society announced the start of the International Fine Art Competition “Tears of Happiness”. "Hi! I am the creator of the idea for the competition, my name is Vladimir. I am a scientific researcher in Mathematical Biology at Oxford University. My project is connected with mathematical modelling of human tears. My colleagues and I are working on helping those suffering from dry eye syndrome. This is a disease which arises due to a decrease in the quantity and quality of tears and leads to discomfort, dryness, a burning sensation in the eyes and even a loss of sight. Mathematical modelling of the dynamics of the tears on the eye surface helps scientists to reach a new level of understanding of the disease. Mathematical modelling of the human tear film. One of the members of my research team is an ophthalmologist who has told me a lot of interesting facts about human tears. For example, that a child does not produce tears during the first few months of his life; or that during our childhood we blink several times less that when we are adults; or that a rabbit blinks only once every 40 minutes! But the fact that amazed me the most is that crying is good for us! Tears are incredibly good for our eyes! I believe that my work will help us understand how to treat dry eye syndrome and that we will be able to cure this disease in the future. I have already published two research papers on this problem. Unfortunately, the society does not pay enough attention and does not use enough resources to combat dry eye syndrome, and it needs to be changed! I think that if tears are good for our eyes, then we should cry! And of course, people should cry from happiness! I cannot make people happy, but I can try to create something to bring people joy and make them cry through laughter, to cry from happiness! The first idea I had was to create a collection of pictures called “Tears of Happiness” united by one idea and capable to draw attention to the necessity of research and fighting dry eye syndrome. I only did three years at art school myself and I doubt that I am capable of drawing these pictures myself. But I believe there are many great talented artists in the world who are capable of this! This is how the idea of the art competition "Tears of Happiness" came about, the result of which will be a selection of several of the best pictures. But the creation of the collection is just the start. It must be shown to people, to be made well-known and recognisable. It is in my power to create an exhibition of the collection in Moscow, London and Oxford, I also travel a lot as part of my research carreer and would like to organise exhibitions in many other world towns. (In 2012 I visited Melbourne, Brisbon, Singapore, Hong-Kong, Moscow and Saudi Arabia.) As well as exhibitions, I plan to use other techniques to make this collection famous. I will be very happy if anyone has any ideas to share about how to achieve this, and is able to help me organise exhibitions of the collection. The project could be developed much further if we find those who wish to support “Tears of Happiness”! "